I started off with their house made chocolate syrup hot chocolate and I loved the presentation of it! 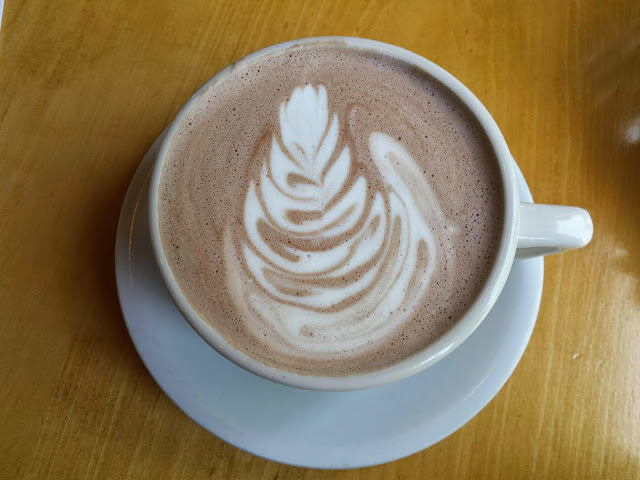 The little design that's typically seen in espresso drinks was on the hot chocolate. It was creamy and not too hot and it wasn't too sweet either. 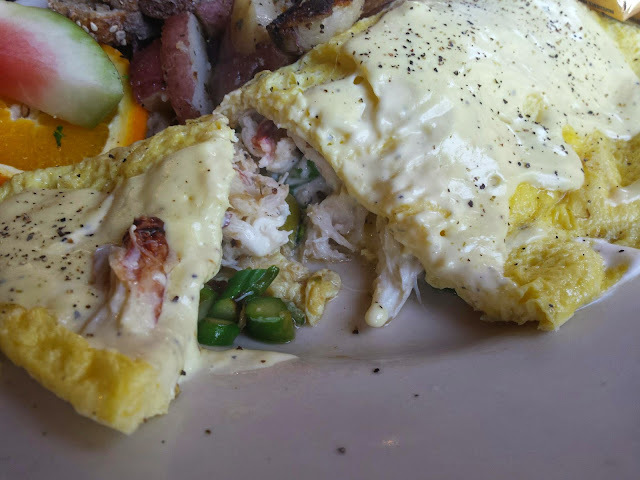 I went with my mom and she ordered the Dungeness Crab & Asparagus Omelet. This was absolutely delicious! I usually highly dislike omelets, especially when the egg is mixed in with all the filling. 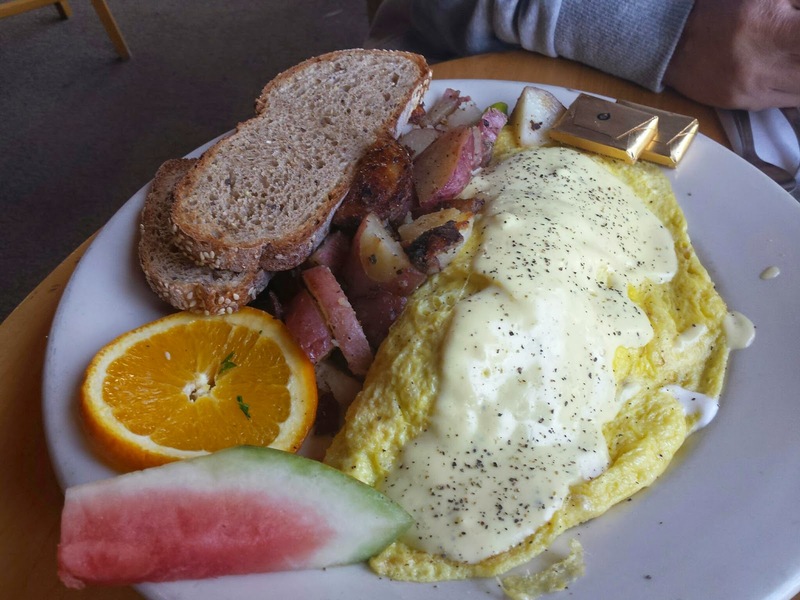 This omelet, however, was perfection. They weren't cheap on the crab meat and loaded it up. The asparagus was chopped and still had their nice green color and a nice crunch. The cheesy cream sauce on the outside was a nice layer of flavor too. Add a bit of Tabasco to the top and you're good to go! The potatoes that were served with the omelet were really good too-well seasoned and not too salty. 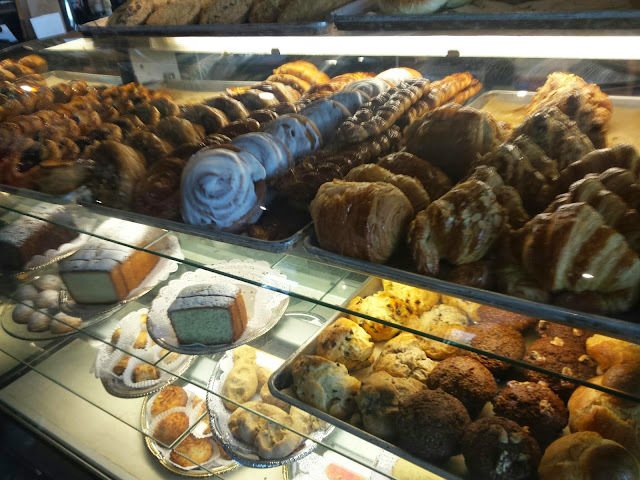 The bread was delicious too--I think its the one they bake themselves! With the butter and the jam? Perfection! 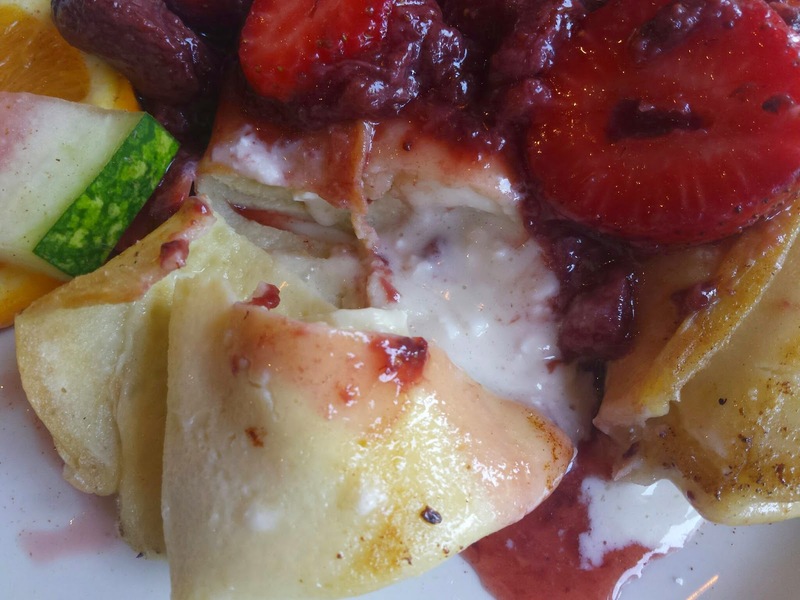 My dish was the Blintzes (named with grammy or something, sorry I can't remember!) They were filled with either ricotta or cottage cheese? I thin k it was cottage cheese, but either way it was extra yummy! 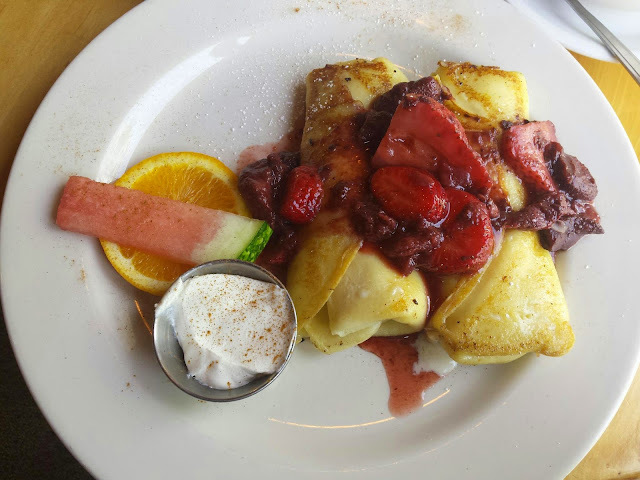 The blintz pancake part was nice and eggy. I kind of wished there was more of the cheese filling, but other than that I have no complaints. The strawberry compote wasn't too sour or overly sweet--it added a nice tartness to the dish. For a little extra creamy flavor, the sour cream added a nice touch as well. Both dishes came with the smallest/dinkiest piece of watermelon though, so that was almost unnecessary. Overall I am a happy camper and would love to come here again and maybe also for lunch too. Inside, the place is packed with people and there's a lot of hustle & bustle. I'd recommend getting there earlier as opposed to later so you don't have to wait long. We only had about a 10 minute wait but ended up with a small table, but we didn't mind since we were hungry! 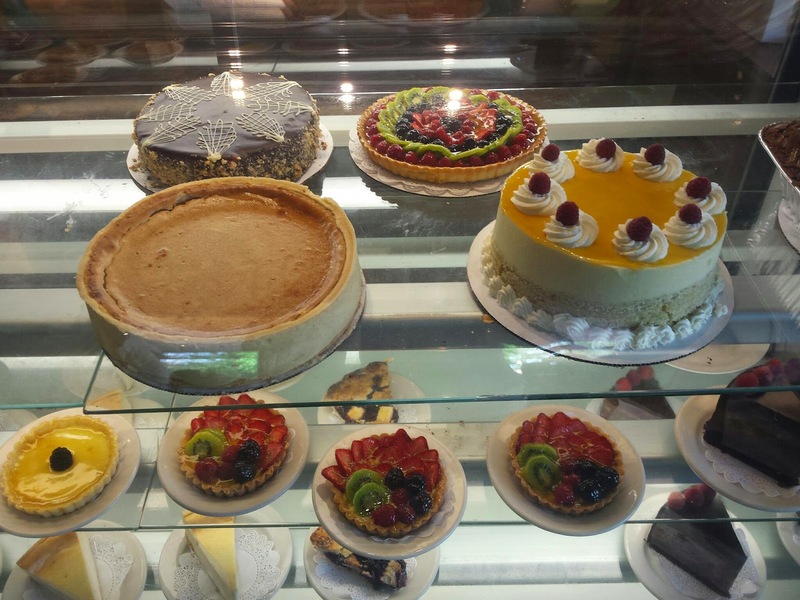 The service was great and the waiter that helped us was friendly. 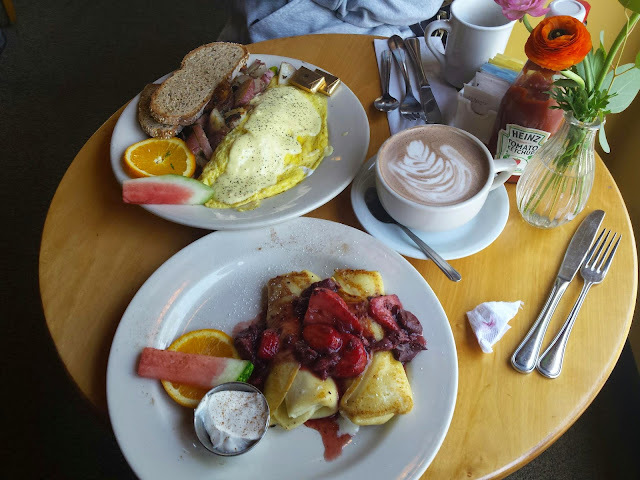 Readers, do you love breakfast foods? What is your favorite breakfast dish? Let me know! yum yum and yum ! !